These art tissue pumpkins can be enjoyed at Halloween, Thanksgiving, or any time you want to add a bright splash of color to your Fall decorating. 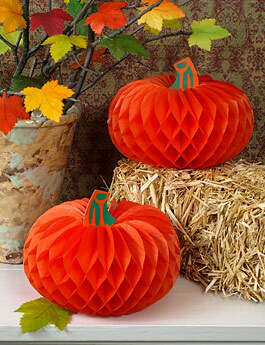 The fold-open, three-dimensional honeycomb pumpkins secure easily with metal clips and can be used year after year. Medium pumpkins are 5" high by 7" wide. Set of two.